changed over the last 7 years. Google’s latest feature lets you travel back in time – no Delorean required. Starting today, Google has turned its popular Google Maps service into a virtual time capsule, letting see how the world around you has changed over time since the 2007 launch of Street View. 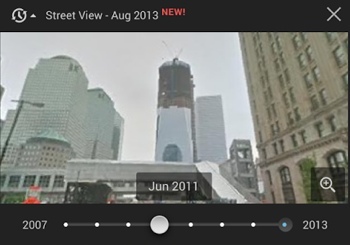 To use the new feature, keep an eye out for a clock icon in the upper left-hand area of Street View images. When you click on it, you’ll gain access to a slider that lets you turn back time to see how the area in question looked during other passes of Google’s Street View camera car. If you don’t yet see the clock icon, be patient – the feature is still being rolled out and is not available to everyone yet. You can learn more about Google’s new Street View time machine feature by visiting the Google Blog or by watching the short promotional video below. To give the new feature a try, head over to Google Maps.